As usual with CNZ Audio. the build quality of the Booster Guitar Effects Pedal is great and the design is awesome. All knobs are weighted for ease and fine tuning effects. The body is made of a solid metal build with an awesome vintage rocket design. While it has a solid build, its mini size allows it to be lightweight, easy to travel with, and leaves plenty of room on your pedalboard. The bottom of the pedal has a thick rubber pad to keep it still on any surface. This pedal has the capability to boost your sound to give you whatever tone you desire. This pedal plus your guitar will make a great dynamic sound for any genre. Don’t be fooled by the size or price of the CNZ Audio Booster Effects Pedals! It provides great power and control for you advanced guitarists! This pedal is perfect for the budding guitarists in that it’s simple to use. Gain an ear for what to boost and this pedal is a big asset. Inspire Your Music! 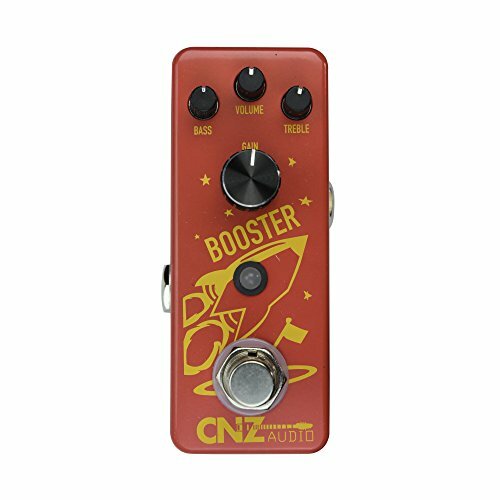 The CNZ Audio Booster Guitar Effects Pedal brings a classic Rocket Booster look to this awesome pedal. Shoot for the moon with the broad capabilities and ease of use, controlling both the gain and the high end and low end signal. The Bass knob allows you to control the amount of low end in your tone. Turn it up for a deep, very full sound or turn it down to give a nice high end presence. The Treble knob controls the amount of high end sound you want in your guitar. Bringing it down helps for low droning effects while turning it up gives a pinging, crisp attack. The Volume knob at the top controls the overall output of the pedal. Whether you want to control all of your highs and lows with the pedals, or manage a small part of it, this knob is capable of great control. The Gain knob adjusts the initial effect that the bass and treble knobs have, boosting the sound of your guitar. Turning the gain knob up increases the effects of both the treble and bass effects, also increasing the sound. If you want the pedal to have less of an effect on the EQ, turn the gain down for a controlled effect. Inspire Your Music!